The Ford GT90 was a concept car manufactured by the Ford Motor Company. It was unveiled in January 1995 at the Detroit Auto Show as "the world's mightiest supercar". Claimed performance included a top speed 235 mph (378 km/h) from a 720 hp (537 kW;730 PS) quad-turbocharged V12 engine DOHC, the exhaust of which was claimed to be hot enough to damage the body panels, requiring ceramic tiles similar to those on the space shuttle to prevent this. The mid-engined car was a spiritual successor to the Ford GT40, taking from it some styling cues, such as doors that cut into the roofline, but little else. 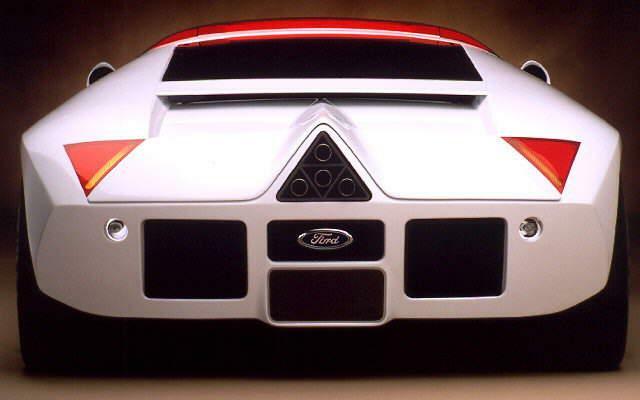 All angles and glass, the Ford GT90 was the first Ford to display the company's "New Edge" design philosophy. The GT90 was built around a honeycomb-section aluminum monocoque and its body panels were moulded from carbon fiber. The GT90 was built by a small team in just over six months and, as a result, borrowed many components from another high profile stablemate—the Jaguar XJ220. The all-round double wishbone suspension and the five-speed manual gearbox came from the Jaguar, while the engine was a siamesed 4.6L DOHC V8 block (from the Lincoln Mark VIII) with 2 cylinders cut off. The GT90's 48-valve V12 was a six-litre engine which, if Ford had ever produced it in volume, might have produced up to 720 hp (537 kW), thanks to four Garrett AiResearch T2 turbochargers. The engine was based on the Ford Modular engine. Two Lincoln V8 engines each had portions removed, namely the last pair of cylinders from the rear of one engine and the first pair of cylinders from the front of the other engine and the cut down engines were welded together. In total, this yielded a 90-degree V12, with 90.2 mm bore and 77.3 mm stroke. Jacques Nasser, then a Ford executive and eventually CEO, was very proud of the car, and kept a model of it on his desk, as seen in a documentary on the U.K. television network Channel 4 on the Firestone tire incidents. In the Top Gear episode first broadcast on October 26, 2003, Jeremy Clarkson stated "I actually drove this and it was horrid. It had a top speed of 40 (mph) and it handled like it was in a cartoon"